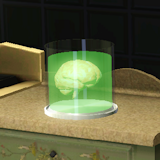 Canister can contain an extracted Sims Brain. Once used by Dr Solon to contain the brain of the former criminal Timelord President Morbius. More recently used by New Earth scientists, to hold the remains of the last sim, most notably Cassandra.